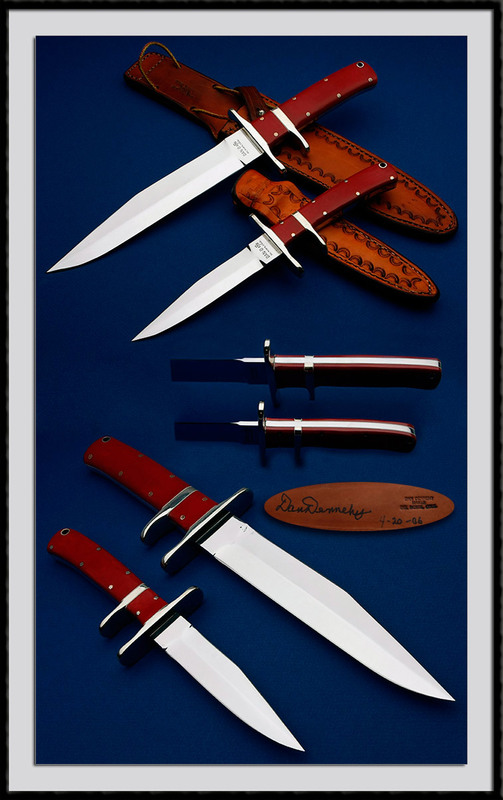 Dan Dennehy, member of the Blade Cutlery Hall of Fame and founding member of the Knifemakers Guild crafted this Matched set of Sub-Hilt Fighters, ATS-34 Blade steel, BL = 7 3/4" & 4 7/8”, OAL = 13" & 9 1/2", Nickel Silver fittings, Full tang, Red linen Micarta accented with Mosaic pins and a SS lined Thong hole. Fit and Finish are Top shelf. Condition is near Mint with light handling marks and the sheathes show light wear.